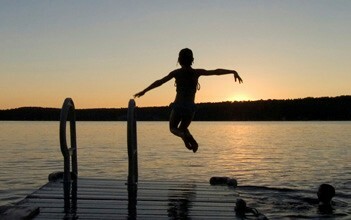 Midsummer is upon us, with marinas and sailing programs in full operation and lots of kids swimming. With this in mind, now is a good time to increase your knowledge of Electric Shock Drowning (ESD). Many people have never heard of ESD, and those that have typically don’t realize the common situations that can be putting people at risk for ESD. These common waterfront scenarios seem innocuous, however ESD should be considered as a risk in each. This Gowrie Risk Report helps explain why. A sailor cleaning his or her boat’s bottom before a weekend race. A powerboat owner swimming to inspect a new propeller while tied to the dock. A marina employee falling off a new dock. A boat owner climbing out of the water using the metal ladder on the swim platform. A group of kids jumping off a marina dock and using the marina’s emergency escape ladders toget out. An orange extension cord draped across a lake dock to charge a ski boat’s battery. What exactly is Electric Shock Drowning? ESD is caused by alternating current (AC) flowing through fresh water encountering a human body. The current tries to pass through the body and causes skeletal muscular paralysis, which ultimately results in a drowning. The electricity tends to enter the water from an electric fault from a nearby dock or marina’s wiring, or from a boat that is connected to a power supply. Often, the electric fault occurring from the boat is intermittent and only leaks current into the water when a switch is flipped and an electrical device cycles on. ESD is a relatively new problem, given that 20 years ago very few docks were powered. Given the prevalence of electric boat lifts, lights, and shore-power connections on docks of all sizes and at nearly every marina, the risk of ESD is real today. In the 1980s it was commonly considered safe to dive off a dock without a thought of ESD. Today, the common summertime activity of swimming off a dock or diving under a boat can result in a tragedy. While ESD can occur in salt water environments, the risk is much higher in fresh water bodies of water (lakes, ponds, rivers) because of differences in conductivity. Salt water naturally has a high conductivity and low resistance, so leaking current in water tends to go around a human body to stay in the low resistant salt water. In fresh water, which has low conductivity and high resistance, the electrical fault or current seeks a path of lower resistance to get back to its source – and a human body can serve as this low resistance path. Fresh water is nearly 70 times more resistive than salt water. Tiny amounts can be deadly. In fresh water, minute amounts of leaking alternating current cankill. Just 15 milliamps (mA) can cause skeletal muscular paralysis, while 100 mA can cause death within a few seconds. Many times, it is later discovered that the leaking current in an ESD resulted from faulty wiring done by an amateur, which did not meet marine code. The marine codes in play are NFPA 303 (Fire Protection Standard for Marinas and Boatyards), NFPA 70, and National Electric Code 555 (NEC).Often boats not wired in accordance with standards set forth by the American Boat & Yacht Council (ABYC) can be a source of AC leakage. Ed Sherman, a certified master technician and Vice President and Education Director at the ABYC shared with Gowrie Group his recommendations related to marine wiring and reducing ESD risk. “One of the most common sources of AC ground faults on boats are onboard water heaters that have developed electrical leakage in their heating elements. This is not enough to trip a fuse or circuit breaker, but it is definitely enough to present a potentially dangerous level of electrical current into the water around a boat. Boats that have had electrical repairs performed on them by land-based electricians are also often the cause of leakages. Non-marine electricians will often innocently wire boats as they would a home, without knowing that the wiring configuration requirements on boats is quite different from homes. I strongly recommend that you only have your boat wiring performed by and checked by an ABYC certified marine electrical specialist. Don’t swim in or near freshwater marinas, docks or boatyards energized with 120-volt AC power. If you are a boat owner, have your boat inspected by an electrician with current ABYC (American Boat and Yacht Council) Electrical Certification or by an ABYC Certified Technician. If you keep your boat at a marina, talk to the marina owners or operators about the danger of electric shock drowning. Ask if GFCIs are installed on all shore power pedestals and on all marina wiring circuits. Ask if their marina is regularly inspected by qualified electricians who are familiar with National Fire Protection Association Codes NFPA 303 and NFPA 70. Tell others about the danger of Electric Shock Drowning. Kellie Crete manages Gowrie Group’s Safety & Loss Prevention practice area and is an OSHA authorized instructor. Whitney Peterson is Gowrie Group’s VP of Marketing. For more information, contact them at kelliec@gowrie.com or whitneyp@gowrie.com, or log onto gowrie.com/safety. With offices in Westbrook and Darien, Connecticut; Marshfield, Massachusetts; and North Kingstown and Newport Rhode, Island, Gowrie Group is one of the nation’s top 50 independent insurance agencies, providing total risk management services to individuals and businesses with complex insurance needs. Their portfolio of offerings includes commercial, home/auto, equine, and yacht insurance, as well as employee benefits solutions. For more information, visit gowrie.com or call 800-262-8911.